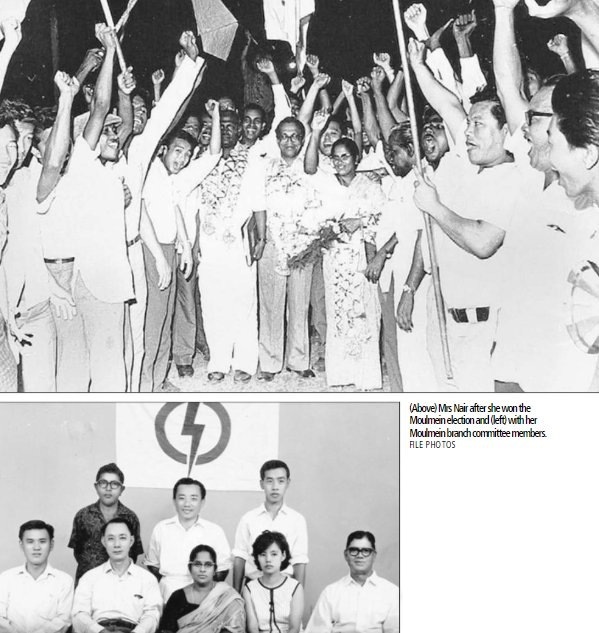 She married her childhood sweetheart and stood by him as he went from anti-colonial fighter to political prisoner to founder of the National Trades Union Congress (NTUC) to President of Singapore. 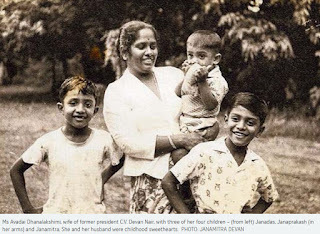 Ms Avadai Dhanalakshimi, wife of Singapore's third President C.V. Devan Nair, was a mother of four - three boys and a girl - who held the family together through tumultuous times. She also had a brief political career of her own. Indeed, when Singapore separated from Malaysia in 1965, she and her husband held elected seats in different countries. She supported and encouraged him in his struggles and fearlessly faced the challenges that life threw at her. At the same time, she was a typical Tamil woman of her time, a loving but strict mother. It was she who drove the children to school and to their extra-curricular activities, took them swimming, and made sure they were fed and clothed properly. That is how her children remember her. Said eldest son Janadas Devan, 64, Chief of Government Communications: "Our home and life revolved around our mother. Our father couldn't have achieved what he did without my mother by his side. "Indeed, he might not have thrown himself into politics, when it was terribly risky to do so - he could have lost his life - if he didn't feel my mother could take care of the children if something happened to him." She was usually in a sarong and simple blouse at home, with very few ornaments, the red auspicious dot on her forehead and a ready smile on her face. Mrs Nair, a fourth-generation Singaporean, was born in 1925, the third of six children. She lost her mother Anjalaiammal at the age of seven and her father Avadai Thevar, a contractor in the building industry, at the age of 11. She, her sister and four brothers, were then brought up by their maternal grandmother and maternal uncle Gopal. She was educated only up to primary three. She had to stop school because the family could afford to educate only the boys. Mrs Nair helped educate her brothers and considered education the most important thing for her own children. Mr Janamitra Devan, 62, who has held senior positions at the World Bank and McKinsey & Company, remembers that he did not particularly care for academics at first. He wanted to be a pilot instead. But Mrs Nair was determined that he should advance his studies. He went to the Philippines for a year before proceeding to Indiana University in the US, where he graduated with honours before going on to obtain his PhD in economics. When she and Mr Nair, a Malayalee, wanted to get married, there was opposition from her family. But she was firm in her decision. "We used to play together...childhood sweethearts," she had told The Straits Times. "I said either him or I won't marry. I'll take care of my brothers all my life." Her uncle Gopal, a fervent anti-colonialist, who opposed the marriage, eventually came to admire Mr Nair for standing up to the British. He agreed to the union after Mr Nair was released from his first political detention from 1951 to 1953. The couple married in August 1953. Barely three years later, Mr Nair was detained again. For the next three years till his release in 1959, when the People's Action Party formed the Government, she brought up Janadas and Janamitra on her own. She also managed the finances of the family. In 1964, she built a modest house on her share of her father's land between Coronation Road and Bin Tong Park, without borrowing a single cent. Among other things, she had squirrelled away what she could from the pittance Mr Nair earned as a unionist, and later from her MP's allowance, which was at that time $500 a month. During the Japanese occupation, and when Mr Nair was in prison, Mrs Nair did various things to make ends meet. She grew vegetables, made brooms from coconut palm fronds and took in sewing work. Mr Janadas Devan said his mother initially found it hard to accept that her boys were marrying non-Indians. His wife Geraldine is Chinese, while Mr Janamitra Devan's wife Sabrina is a Chinese Filipina. But Mrs Nair also remembered her own struggle to marry the man she loved. When she realised her sons had made up their minds, she consented, only insisting the marriages be conducted according to Hindu rites. Mr and Mrs Nair spent their last years in the US and Canada. Mrs Nair died in Hamilton in Ontario, Canada, in April 2005, just eight months before the love of her life. When she had pneumonia and was on life support, the doctors said she was unlikely to survive. The children knew how she would wish to be treated in these circumstances since she had signed a "living will", specifying that no extraordinary steps be taken to prolong her life. Mr Janadas Devan informed her of her condition and she herself made the decision to have her life support removed. Death held no fear for her, he said. "If she made up her mind about something, she would not change it. Till the moment of her death, she had control over her life." Abiding by her wishes, Mr Janadas Devan and Mr Janamitra Devan immersed her ashes at the confluence of the Ganges and Yamuna rivers in India, a sacred spot for Hindus.